Get visibility and curb appeal with gooseneck exterior light fixtures. Outdoor gooseneck fixtures grace various retail and restaurant exteriors as sign, awning, and architectural lighting. The smart versatility of these outdoor lighting fixtures makes exteriors look professional, memorable and – of course – brilliantly lit under cover of dark. Shop our selection of commercial goosenecks by shade style including the Angle, Emblem, Dome, Barn, and Warehouse Shade designs. Choosing a gooseneck exterior light should be not only a functional decision, but also one that suits the project's aesthetics. For this reason, industrial light fixtures from Sign Bracket Store are never a one-size-fits-all product. Our comprehensive assortment includes different shade and arm configurations and color and finish options. We can also work on custom order requests. Gooseneck outdoor lighting brings brilliance to architectural and sign lighting design. At Sign Bracket Store, our array of alluring gooseneck exterior light styles incudes commercial fixtures for durable outdoor decorative lighting and sign lighting. 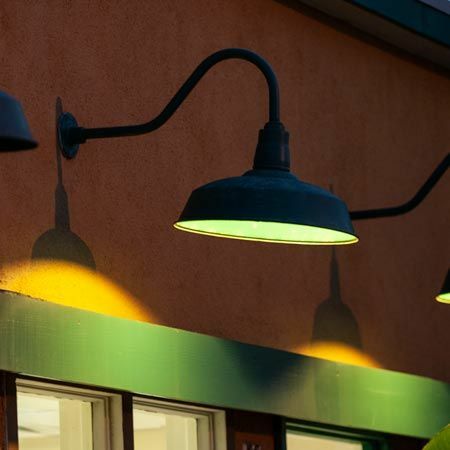 And with outdoor gooseneck fixtures that feature five distinct shade silhouettes, this is a well-rounded option that combines practical function with the creative side of commercial lighting design. Designers, architects and project planners turn to exterior gooseneck illuminators when they need a functional light source that also boosts curb appeal. Commercial gooseneck lighting has a visual impact that is professional and demonstrates a sense of style. Depending on the property, different shade and arm combinations are available to place fixtures anywhere along the design spectrum - traditional, modern, understated or edgy. Gooseneck outdoor light fixtures are often most recognizable by the type of shade displayed. Here, our clients can browse gooseneck exterior light style by shade type including Barn, Warehouse, Emblem, Dome and Angle reflectors. For contemporary to modern lighting, the Dome, Emblem and Angle are a chic and updated option. For a classic or vintage look, Warehouse and Barn Shades draw on agricultural and industrial lighting styles for their inspiration. Whichever shade type is preferable, these fixtures are customizable in terms of the size, accompanying gooseneck arm, and also the type of lamping for which each fixture is wired. Outdoor gooseneck light fixtures come with nearly two-dozen color and finish options. Manipulate the style by playing with arm length and curvature to achieve a desired look, whether it be straightforward gooseneck commercial lighting for signs, or more ornate outdoor decorative lighting. Optional swivel coupling can also assist with mounting at a particular angle in relation to a target space. All of the outdoor fixtures you see here are each commercial grade and fabricated out of high quality powder coated aluminum. While they're heavy duty, each gooseneck exterior light is also polished in styling, so using them to spotlight interior spaces or signage is never out of the question. As our standard configuration for commercial goosenecks, the Sign Bracket Store offers incandescent 120V sockets that accept a variety of bulbs, including CFL and LED, and most styles can also be ordered with a four-pin compact fluorescent socket and integral ballast or a metal halide socket and integral MH ballast. Call toll-free to work with a lighting expert on your next project.